Magento 2 Pricelist is used to create custom price rules according to various entities like the product, product category, Product Minimum Quantity and Product Minimum Price. The admin can create various price rules very easily for various entities and use the created price rules in creating a price list. The price list can be created by simply adding price rules from the created price rule list. 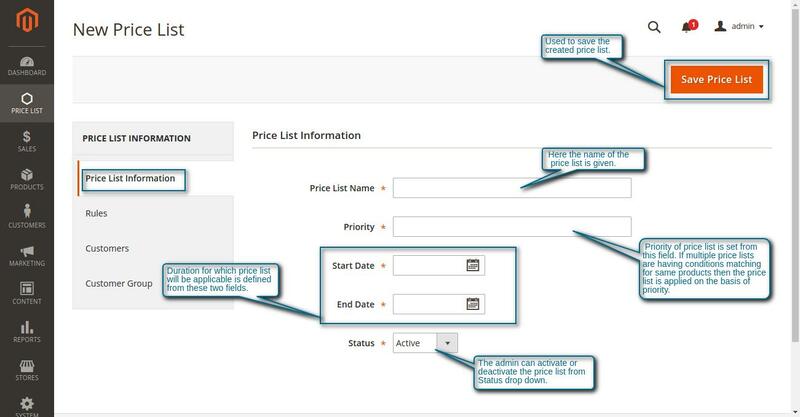 The admin can very easily set a price list targeting the customers/ customer groups. This extension is very beneficial for the ones who want to keep their various customer available with different and attractive pricing. **Note: The Price Rules will be applicable on the base price and not on the Special/Group/Tier pricing. The Admin can create rules for pricelist. 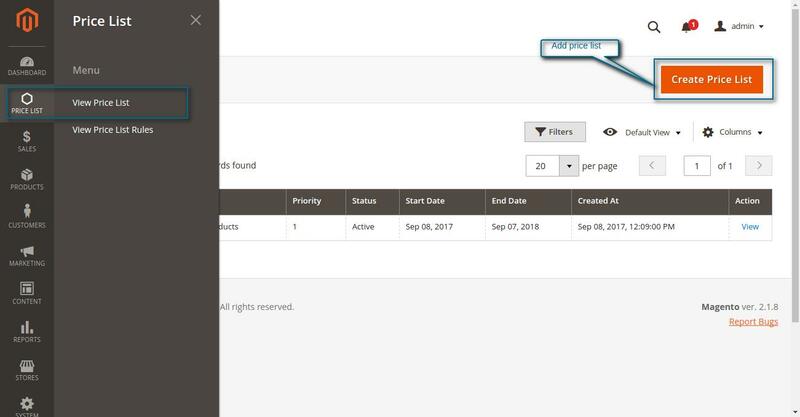 The Admin can assign multiple rules for pricelist. 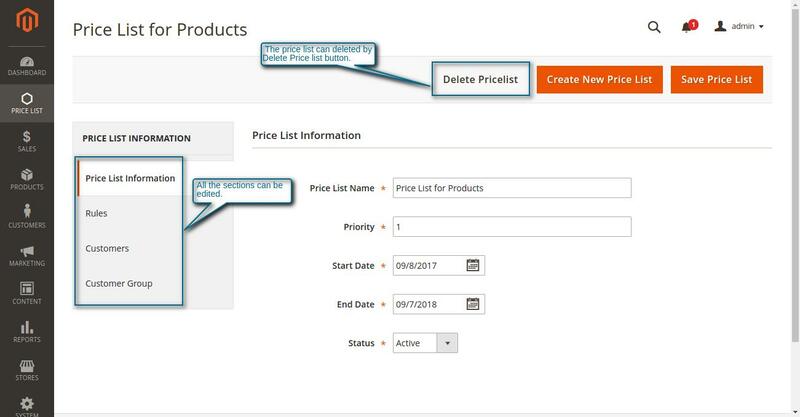 The Admin can assign multiple pricelist to customer or customer group. 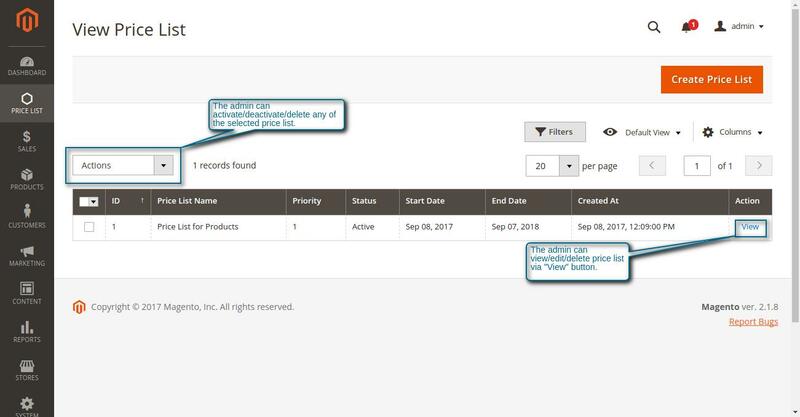 The Admin can set rule according to product. The Admin can set rule according to category. The Admin can set rule according to quantity. The Admin can set rule according to total product price. The Admin can create the rule to increase price. The Admin can create the rule to decrease price. The Admin can set the priority of rules. The Admin can set the priority of pricelists. The Admin can set start and end date for the price. After the installation process of Magento 2 Pricelist is completed the admin can see Price List tab in his backend admin panel. The admin can add/ view/ edit/ delete price rules to manage Price List Rules by navigating through Price List ->View Price List Rules. 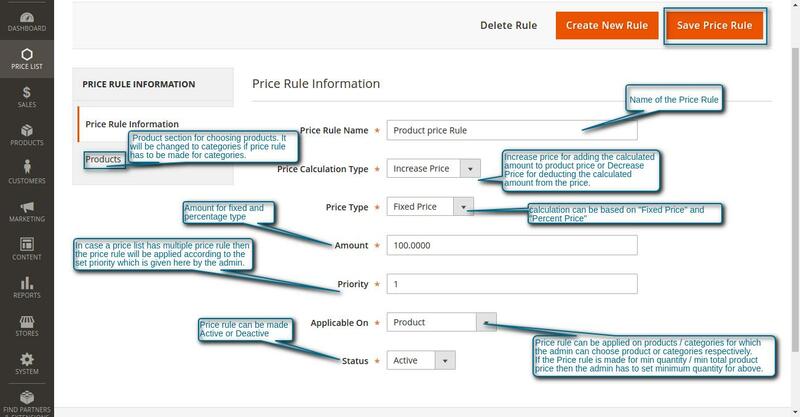 The admin can add price rules by navigating through Price List -> View Price List Rules -> Create Rule. After clicking “Create Rule” the admin will be redirected to New Rule page. Here the admin will do the settings for two section basically if the price rule is made for products or categories. The second section respectively will be the Product to choose the products for price rule or it will Categories to choose categories for price rule. If the price rule is made for Product Quantity and Total Product Price then the admin has to do setting for only one section. The common section for all will be Price Rule Information. The Price Rule Information is for setting major basic information required for creating a price rule. It can be navigated through Price List -> View Price List Rules -> Create Rule -> Price Rule Information. Price Rule Name: Here the admin will enter the name of the price rule. Price Calculation Type: The admin can choose “Increase Price” from the dropdown to add the calculated amount to the product’s price or “Decrease Price” to subtract the calculated amount to the product’s price. Price Type: The price calculation can be done by “Percent Price” or “Fixed Price”. Amount: Here the admin will set the amount for the “Price Type”. Priority: The admin will set the priority for the price rule. Please Note: If a price list includes multiple price rule and multiple price rule are applicable on same products then, the price rule with least value for “Priority” will be applicable finally. Applicable On: The Price rule can be applied on Products / Categories / Product Quantity / Total Product Price. Please Note: If price rule is applied on Product Quantity / Total Product Price the, the admin will set the minimum quantity for both the types. Status: The price rule can be made “Active” or “Deactive” by the admin. The Product section is for selecting the product on which the price rule will be applied. It can be navigated through Price List -> View Price List Rules -> Create Rule -> Products. Products can be selected by product’s check boxes. 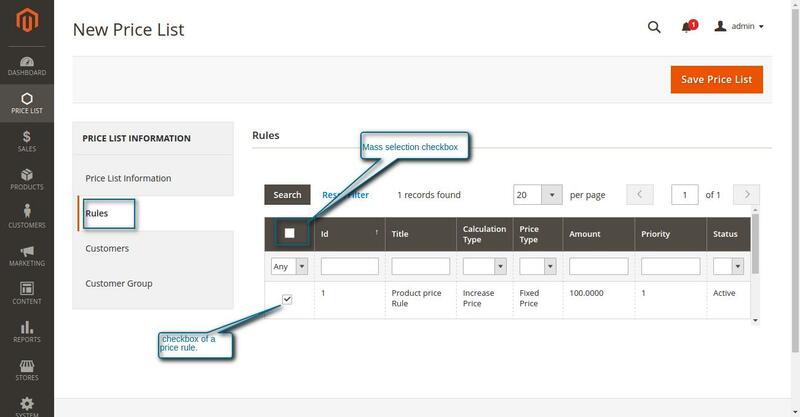 All products can be selected at once for the price rule by using mass selection checkbox. Lastly, the admin can save the price rule via “Save Price Rule” button. The Categories section is for selecting the product on which the price rule will be applied. It can be navigated through Price List -> View Price List Rules -> Create Rule -> Categories. The admin will select one or multiple categories from the multi select box. 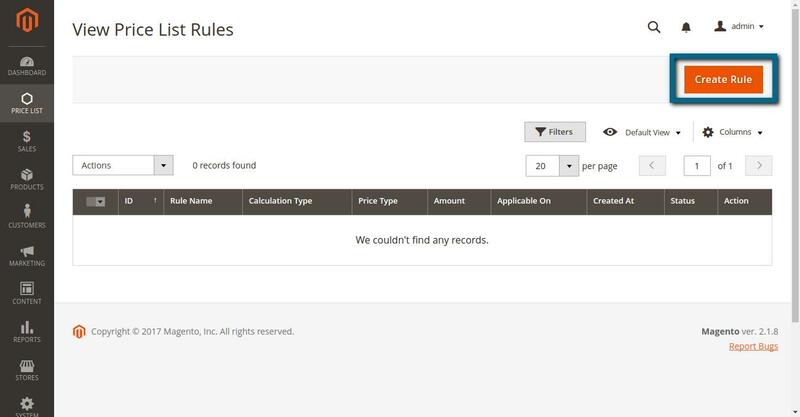 The admin can view/edit/delete price rules by navigating through Price List -> View Price List Rules -> View. 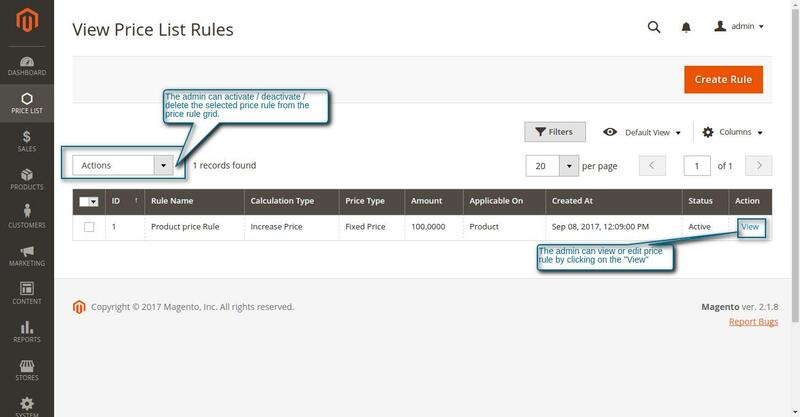 The admin can view any price rule via “View” button from the given price rule grid. Any selected price rule can be activated, deactivated or deleted from price rule grid via Actions drop-down option. The view option opens the price rule information and selected product/category(if price rule is for product/ category) of the selected price rule. The admin can view/edit/delete the price rule according to the requirement. The admin can add price rules by navigating through Price List -> View Price List -> Create Price List. After clicking “Create Price List” the admin will be redirected to New Price List page. Here the admin will do the settings for four sections. The first section Price List Information includes all the basic information for creating a price list. It can be navigated through Price List -> View Price List -> Create Price List -> Price List Information. Price List Name: Here the admin gives the name of the price list. Priority: The admin sets the priority of the price list. If multiple price list has conditions matching for same products then the price least will be applied on the basis of priority. Start Date: It is used for setting the starting date on which the price list will be applied. End Date: It is used for setting the ending date of the price list. Status: The admin can activate or deactivate the price list from this field. Rules can be selected by rule’s check boxes. All rules can be selected at once for the price list by using mass selection checkbox. Lastly, the admin can save the price rule via “Save Price List” button. 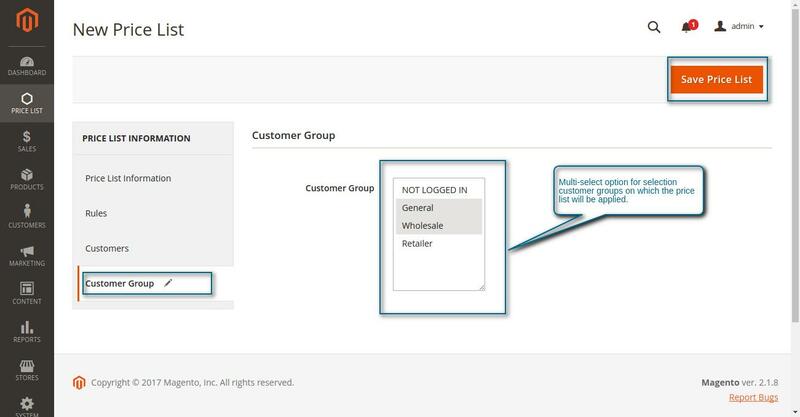 Customers can be selected by rule’s check boxes. 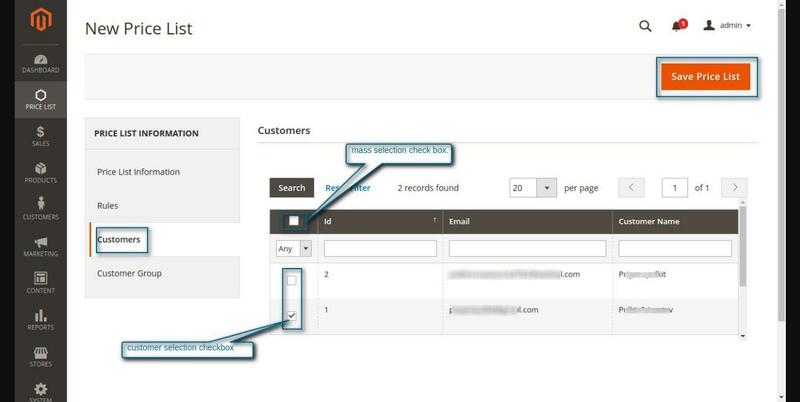 All customers can be selected at once for the price list by using mass selection checkbox. The last section Customer Groups is for selecting customer groups on which the price list will be applied. It can be navigated through Price List -> View Price List -> Create Price List -> Customer Groups. It has only one multi-select field to select one or multiple groups, on which the price list will be applied. The admin can view/edit/delete price rules by navigating through Price List -> View Price List -> View. 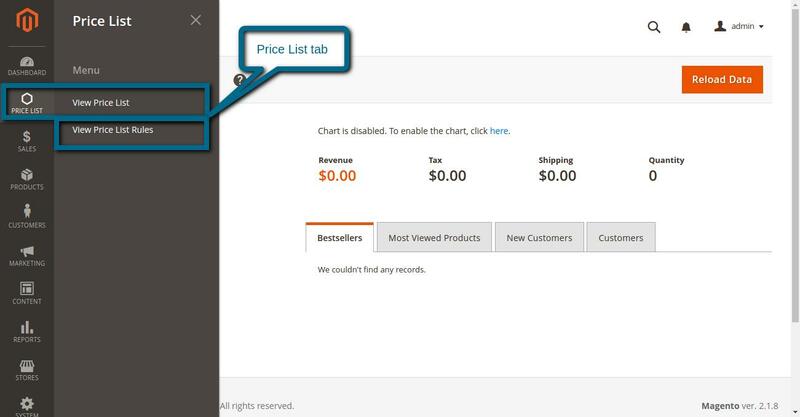 The admin can view any price list via “View” button from the given price rule grid. 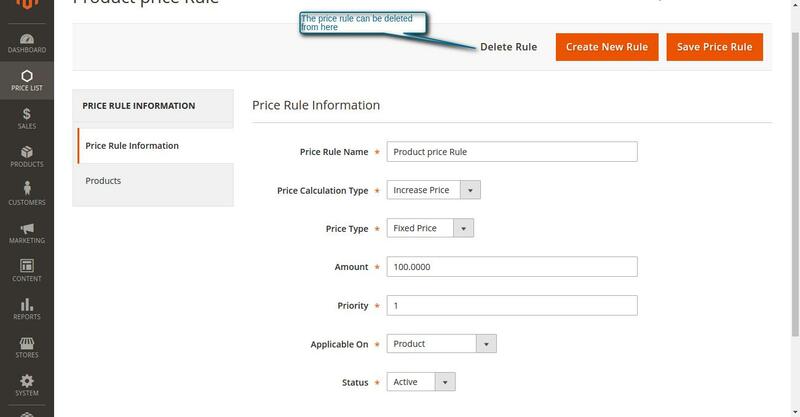 Any selected price list can be activated, deactivated or deleted from price rule grid via Actions drop-down option. The view option opens the price list information of the price list and all the other three sections like rules, customers and customer groups can also be viewed/edited/deleted. The admin can view/edit/delete the price list according to the requirement. Please Note: If multiple price lists are having conditions matching for any same particular product then the price list with the least value of priority will be applied. If the price list is having multiple price rule that are having conditions for any same particular product then price rule with least value priority will be applied. Front End View of Products without Price List Rules. 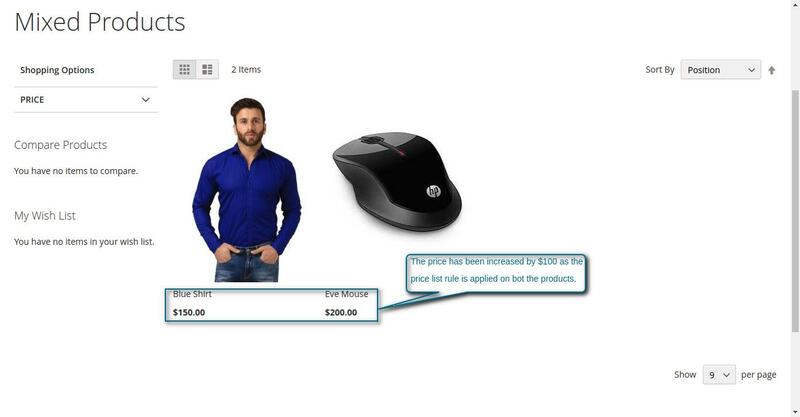 The image below shows two products Blue Shirt and Eve Mouse. In the below image of the front view, there is no price list rule applied on both the products. Front End View of Products with Price List Rules. Now if price list rule has to be applied then price rule and price list has to be created. As the rule is applicable on the product, therefore, the product section will be also set. It can be navigated through Price List -> View Price List Rules -> Create Rule -> Products. 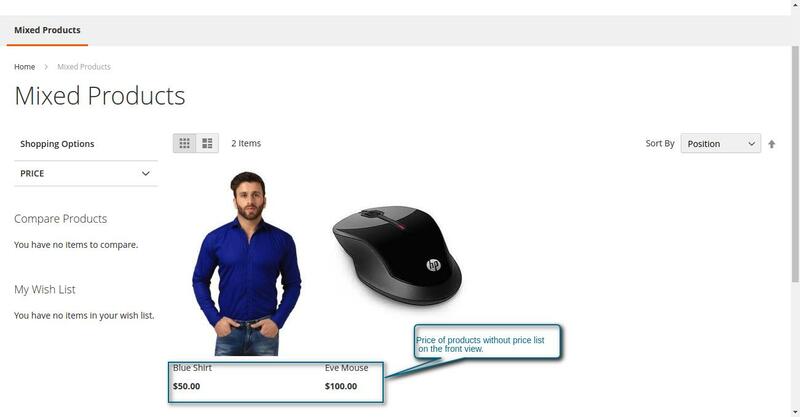 In this, the above two products Blue Shirt and Eve Mouse selected for the price rule. Price List Name: Price List for Products. After this the rules will be selected for the price list by navigating through Price List -> View Price List -> Create Price List-> Rules. For example “Product price Rule” is selected for the price list. After this the customers will be selected for the price list by navigating through Price List -> View Price List -> Create Price List-> Customers. After this the customer groups will be selected for the price list by navigating through Price List -> View Price List -> Create Price List-> Customer Group. For example “General” group is selected from the multi-select for the price list. As the price list named “Price List of Products” is created which includes price rule named as “Product price Rule”. The price list rule created for the two products Blue Shirt and Eve Mouse will be applied after the price list and the rule will be activated. To see the above-created price list rule, the login will be done from the respective customer credentials. The front view of products with price list is shown below. That’s all for the Magento 2 Pricelist extension. If you have any queries or suggestions regarding the extension then you can get back us at webkul.uvdesk.com.